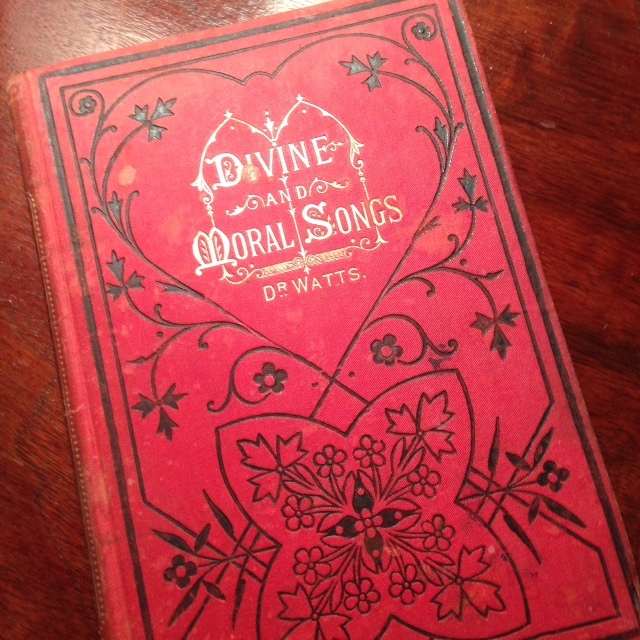 I recently stumbled upon a very old copy of Divine and Moral Songs written by Isaac Watts in the early 1700’s. 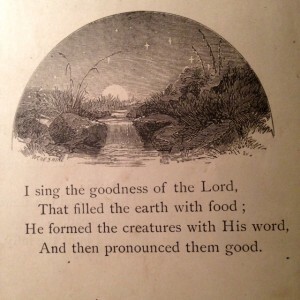 My copy must have been printed some time in the 1800’s because it was a gift to someone in 1884 from a boy and girl’s religious society. When I opened the delicate book, I was struck immediately by the beautiful old artwork, attention to detail, and the old print type used during the time of its publication. But it was the preface that truly gripped my attention. Being a homeschool mom, a Sunday school teacher, and a volunteer youth leader, I recognized that this was addressed to me. In only a few pages, of very readable language, Isaac Watts gave a challenge that is very applicable to our society today. As I read, I was gripped by the fact that these words were penned to an early 1700’s society, when it could have been written to our society three hundred years later. Watts reminded those in his generation that the seeds of faith are sewn early and that it is vital to train up our children with a passion for Christ at an early age. Watts explained that “verse was at first designed for the service of God, though it hath been wretchedly abused since.” Of course, I absolutely love his use of strong adverbs and verbs like “Wretchedly” and “abused,” his point is very clear. He explained that parents of old taught their children “the precepts of morality and worship in verse.” They’ve been using songs and rhymes to help children learn truths for thousands of years. Not only that, but we as believers are encouraged to “teach and admonish one another by hymns and songs, (Col.iii.16)” …I just had to write it the way Watts did. Watts encouraged readers to even use the lovely little book itself as a reward for learning the verses. I found it very cool that even in the 1700’s they were using the reward method of motivation. “What is learned in verse is longer retained in memory, and sooner recollected.” Watts said that the learning of scripture and moral songs learned in one’s youth will help guide their moral decision making. When I read that last sentence I stopped and reread it again. This was written in the 1700’s… and Watts was concerned about the dangerous music of his time? What would Watts have to say about some of the songs popular in our country today? I found it interesting that Watts explained the seeking of such sonnets is to “seek relief for an emptiness of mind.” How often do we see kids sit filling their minds with music containing disturbing lyrics, allowing those words fill their minds like dirty water soaked into an empty sponge? Watts called it dangerous. Watts encouraged the use of these songs during daily or weekly worship, and while I’m sure not many of our children have governors, I loved his encouragement to sing together as a family. What a wonderful time to train up your child and worship together. The preface was wrapped up with a few more encouraging words in the training up of a child in Christ, and ended with a prayer. I am sure you caught the Great Britain part. I found it interesting that, just like me and my concern for my country, Isaac Watts wanted his country to be a “glory among the nations, a pattern to the Christian world, and a blessing to the earth.” I would like the same thing for the United States. The point is, we as Christians have an important job. We are called by God to “Train up a child in the way he should go, even when he is old he will not depart from it.” (Proverbs 22:6). I love to write. It gives my mind opportunity to slip away in to other times, other places, and see into the lives of other people. Whether it’s fiction or non-fiction, writing helps me formulate my thoughts. One of the beauties of writing is that it lets me be creative. As with any art form, writing lets me use words to paint a picture that can send a message and evoke emotion in the hearts of my readers. Until Proven Innocent was a fun book to write because, while the story is historical fiction, it takes place in Northern California, where my husband and I once lived. Northern California is a place rich with history and natural beauty. Known for its many wineries, vineyards, beautiful coastline, redwood and sequoia trees, and picturesque cities, Northern California is a beautiful backdrop for a love story. While living in California, my husband and I took many trips along the Lost Coast, camping, exploring, and hiking along remote trails and rocky hillsides. The love story behind Until Proven Innocent was fun to paint. Within any love relationship there needs to be trust and mutual respect. The relationship between Bethany and Tanner stems from a selfless desire to lay aside personal needs and bless someone else. Both characters threw aside their own safety, needs, and comforts, in order to help the other. Against the odds, they learn to trust one another and find unconditional love. As with any love story I write, Christ is a central figure in the plot. Just as He is a central figure in my life, His presence is crucial in the lives of my characters. His hand in their lives is the driving force behind their love and guides their steps in ways only our heavenly Father could. Another fun part of creating Until Proven Innocent was the book cover design. It was exciting to watch the cover models as they stepped into the persona of their characters and wrapped themselves in the image we wanted to create. 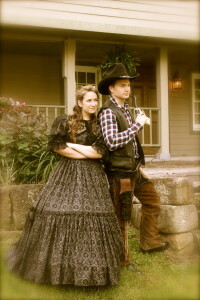 Bethany (the name of the model as well as the main character) and Sam are both college students who have amazing acting talent. I think they had just as much fun with the photo shoot as we did. It was difficult to choose the photo for Until Proven Innocent because there were so many nice ones. While it would have been wonderful to photograph the cover photo in Northern California, we settled on a small historical site in central Ohio. Historic Roscoe Village is an 1800’s canal town in Coshocton, Ohio and a great place to step back in time. Since Until Proven Innocent is a historic fiction novel, Roscoe Village seemed like just the right backdrop for the cover art. There are beautiful places everywhere and beautiful love stories still to be written. But the most beautiful love story in the world is the true story of our Creator and His love for us. No writer in the world can create a story so rich and perfect in love, as the One Who has given us everything and desires for us to love Him and follow Him. I pray that the message of His love will be reflected in everything I write. I love the sassy little grin Bethany has on her face in this picture. Sam is taking himself very serious. 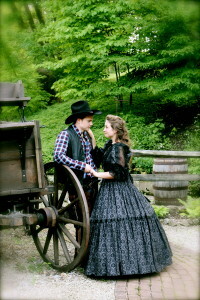 Bethany and Sam had an amazing way of capturing the emotion we expect to see in Bethany and Tanner. The charm of Historic Roscoe Village and the sweetness of this couple make this picture one of my favorites. I once had a friend tell me, “I’d rather play football than watch football.” His reasoning was key, “Why would I want to watch someone else get into shape when I could be doing it?” He wanted to be a doer, not a viewer. I was thinking about this idea recently as we continue construction on our house. In home construction, there are those who sprint, those who run a marathon, and those who take a long adventurous trail hike. We are the latter. We have been building on our house for several years. There are periods in our building process when we pause to spend time looking at Fine Home Building magazines, read design books, go to Lowes, or watch HGTV to get ideas of how we want to do something. During that time we become what I think of as information gatherers. In that case, I would say that the viewing is actually doing something. It’s training our minds, giving us data we can use, teaching us how and sometimes motivating us toward that goal to which we are striving. An individual ceases being an information gatherer and moves to viewer when they stop doing. In the process of the doing, I am also called to assemble together with other believers. God gives me opportunities to fellowship, to be encouraged, to learn so that I might better do. I like to look at that fellowship time as my information gathering time. I have the opportunity to listen to others teach me, hear how they are doing in their journey and gain motivation for the journey. Reading God’s Word is also a great time to gather information. It also brings me to the throne of God where I might allow Him to speak directly to me and build me up in Christ. Then I can do. Then I can go therefore and make disciples… I can forgive, love others, build others up in Christ, honor my parents, seek His kingdom… and I am never alone in the doing. I am on God’s team. He is with me the whole way! To my friend who could not see the value in watching a football game I would challenge him to consider how watching the game helps him learn the moves, see others succeed and even stumble. By viewing, a person becomes aware of the game. Sometimes it is all right to stop building the house and read a few books, magazines, explore the lighting department at Lowes, and watch HGTV, as long as we don’t stop there. We need to do. We need to put into practice the information we’ve been gathering. Christians, we benefit greatly from our fellowship time! We learn how others succeed and even stumble. We see areas of our lives where we need to grow. We become refreshed for the doing. We desperately need our time alone with God, allowing Him to teach us from His Word and refresh us by His Spirit. Then we can be better prepared to do. We’ve all heard those lines before. Sometimes we’ve heard it from our children. Sometimes we’ve heard it from our friends. Other times, we’ve said it ourselves. Even the most self confident, independent and logical minded person has at some point in their lives felt either misunderstood, lonely, or uncared for. But even God understands that those feelings arise between human beings and cause us discouragement. The wonderful thing is that God even gives us guidelines to dealing with those situations. Communication is essential in the Christian life. It is vital to our own relationship with God and it is vital to our relationships with others. What kind of relationship with God would we have if we never talked to Him, if we never read His word, or if we never took the time to be still and know He is God? Without communication there is no relationship. In the Garden, when Adam and Eve sinned against God by eating from the tree He instructed them not to eat from, their first reaction was to hide from God – close themselves off from Him, avoid Him, put up a wall. Even though it was they who sinned against God, they put up the wall. When there is a wall between ourselves and God, there is no communication. In order to break down that wall we must go to Him and confess our sins and then we can receive His forgiveness and the relationship is healed. Confession is communication. After Adam pulled away from God, God called out to Adam. He communicated with him. It was only after they communicated that there was resolution and healing. When feelings arise that we are misunderstood, unliked, or when we sense a distance arising in a previously healthy relationship, chances are it is a communication issue. Jesus prayed specifically for us that we would be one. Ironic that it was in a garden where Adam and Eve pulled away from God and it is in a garden where Jesus prays for connection. Jesus desires for us to be one. He says that He desires for us to be one that we may also be one in Him and so that the world may believe that God sent Jesus. It is important to our walk with God that we be at peace with our brothers and sisters in Christ. We are called to forgive one another. “Be kind to one another, tenderhearted, forgiving each other, just as God in Christ also has forgiven you.” Ephesians 4:32. When Christians are one with one another it communicates something powerful to the world. It communicates a message about Christ that can help the world believe in Him. It is important to communicate. The Bible is full of examples of God communicating with us. This example is instrumental to restoration in our relationships with others. “She doesn’t like me.” …have you tried talking to her? “He doesn’t understand me.” …have you tried talking to him? “We used to be so close – but we never talk anymore.” …so talk. “She doesn’t care.” …have you talked to her about it? Told her how you feel? Of course, I understand, there are those who in their own hurt, stubbornness or rejection of God’s truth, will not respond to our attempts at communicating with them. Sometimes they are not ready. Sometimes they are not in a right place with God. In those situations we can also learn from Jesus by what He showed us. Pray for them. I often tell teens that if there is someone in their lives who either does not like them or they have conflict with, and that person won’t work it out – to pray for the person. I challenge them to thank God for five things about that person every day. It can be a difficult thing to do – but it works. If you can’t communicate with the person about the issue – communicate to God about the person.